It’s wedding season. Seems like everyone and their brother get married in May or October. And when most people think of wedding cake, they think of almond cake with raspberry filling. Traditional. These cupcakes are so good. 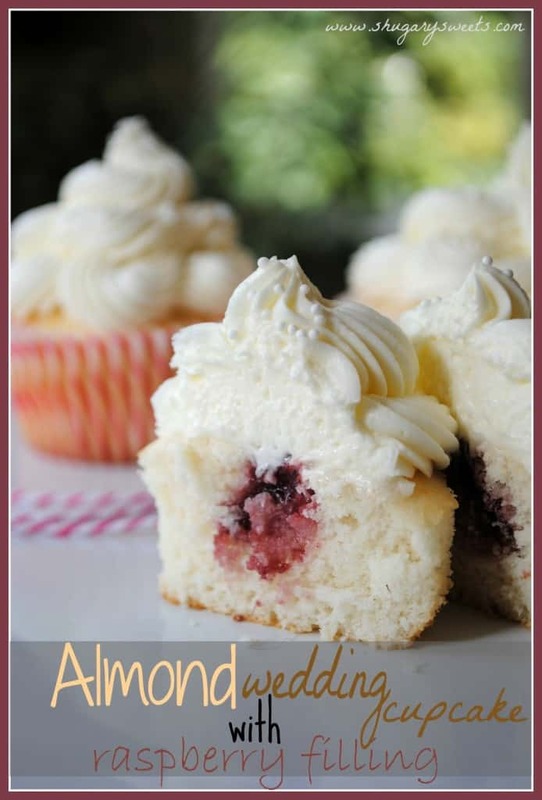 A moist almond flavored cupcake, filled with raspberry preserves. Then I topped them with an almond butter and cream frosting that I whipped until it was so light and airy. I have a friend who says this combination is her favorite. She tries a lot of my treats! Hey, sometimes I need a second opinion. I want you to know my food is taste tested! But back to weddings. Did you know one of the new trends is to have cupcakes instead of cake? I LOVE THIS TREND. I wish 17 years ago when I got married this was a normal option to choose. I don’t remember anything about my cake. I think the only bite I had was the one my husband and I fed to eachother. At least with cupcakes I could have said, “box me up a dozen for later.” And I would have had one awesome treat to eat on our honeymoon drive!!! For now, can I convince you to give these a try? You will fall in love. 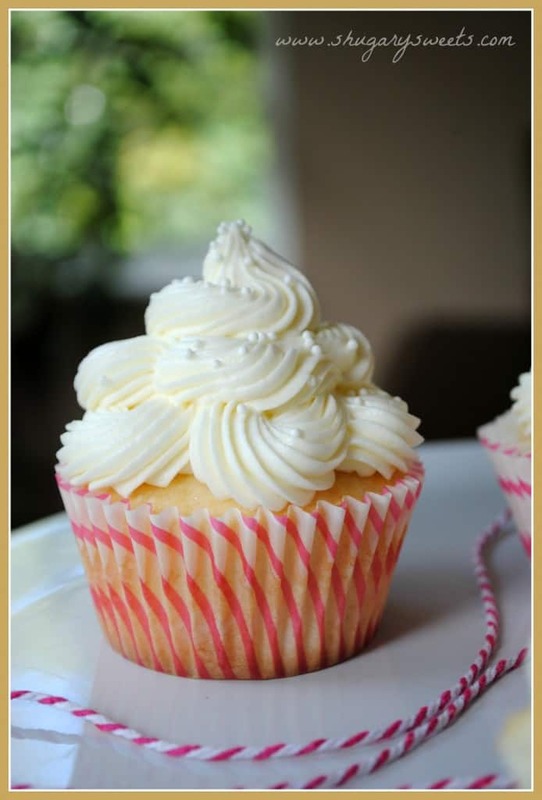 The moist cupcake is my favorite recipe, and you may have seen it here: Vanilla Bean Cupcakes. I added in some almond flavor and it gave them a whole new spin! ENJOY! 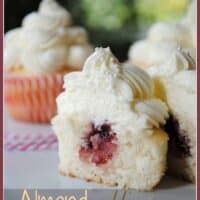 Cherry Almond Cupcakes: using a boxed cake mix as the base, it makes these cupcakes super easy for any home cook! Top them with a sweet buttercream flavored with maraschino cherry juice! Almond Pound Cake with Blueberry Sauce: rich, buttery pound cake flavored with almond. Then topped with a homemade blueberry sauce and almond whipped cream! Almond Truffles: Milk chocolate truffles with almond flavoring, rolled in crushed almonds and coated in white chocolate. Perfect for any holiday! For the cake, whisk together the egg whites, almond extract and 2 Tbsp milk in small bowl until combined. Set aside. Fill cupcake liners half full with batter and bake in a 350 degree oven for 15-17 minutes. Remove and cool in pan 5 minutes, then transfer to a wire rack to cool completely. Fill a pastry bag with raspberry filling. I used a small star tip and poked it into the top of each cupcake. Give a good squeeze, you will see the cupcake rise at is fills. Remove and continue until all cupcakes are filled. For the frosting, beat butter and heavy cream in mixer for 3 minutes. Add in almond extract and powdered sugar. Beat an additional 5 minutes until light and fluffy. These cupcakes sound wonderful. I really like the tiered frosting effect, it’s lovely Aimee. Aimee they look so good! I love the filling! The cake itself looks so light and airy, too. Your cupcakes are always gorgeous! How do you make the swirly frosting? Is it all one swirl or individual ones? I don’t have a wedding to make these for… if I make them I would eat A LOT of them. We have a barn party coming up in November that I think might work tho. Thank you for replying. Glad I checked back when I got home from work. I didn’t. Know how to add my”profile” (email). Almond anything is good with me. These are simply gorgeous Aimee! These look and sound fabulous! A full tablespoon of almond – YUM! Love the way you piped the frosting – beautiful! Omg mouth watering while reading your post. I love that the trend for weddings is the cupcake. LOL it sure makes it a ton easier for us making them:-) And I agree…I wish I could have had a tower of cupcakes that looked this awesome at ours. I don’t remember what ours tasted like and the one we ate a year later was not so good! Your cupcakes always look the best…I love your frosting to cake ratio:-) !!! Oh my gosh your cupcakes are gorgeous!! This is almost identical to my wedding cake, but I had chocolate cake with raspberry filling! I think I need to make your muffins, I have a wedding anniversary next month!! Have a wonderful weekend! These cupcakes are just beautiful! Love the look of these!! And raspberry hiding in the middle? Such a great combo with the almond cake and icing! the frosting on these cupcakes are gorgeous!! they’re like billowing clouds! All in the name of cupcakes! LOVE IT. These look so elegant with your pretty piping. And the combination of flavors is spot on! So pretty! I love your frosting swirls. These look amazing!!! I could eat them all. I do like the combination of flavors here so they sound delicious! these look so good! I love raspberries!! I came your way from Sundae Scoop at I heart naptime. Looks delicious! Can’t wait to try them! Thanks so much! So great! It is nice to share this recipe! I always find only wedding cupcake ideas , never recipes! Thanks! Oh my, these cupcakes look so gorgeous!!! Love the way you piped the frosting!! Made these over the weekend. I imagine this is what crack is to a crackhead. OMG they’re good! Has anyone tried freezing these, either before or after adding the preserves? Would there be enough batter to make 2 8 or 9 inch rounds, for a tier cake? Sounds wonderful would love to make it a cake for my Mom’s Birthday! It only makes 12-15 cupcakes, so I think if you doubled the recipe you should be good to go for two 9inch round pans. Let me know how it turns out!!! Hi Aimee! I decided to just make one recipe & cut the cake in half. I used a different raspberry filling recipe because not to fond of just jam. It was a huge success! My Dad loved the frosting too! He rarely likes “new” recipes. Ha! Thank you so much for sharing your fabulous recipe! It will forever reside in my book! Love, just love it! Well worth the time & effort! Can’t wait to try more of your goodies! I’m so glad you loved the cupcakes. These are such a big hit, not only with my family, but one of my most requested orders! Would this recipe work as an 8 inch round cake? I just saw your response to Tressa. Should’ve read before posting. Thanks so much!! Did anyone actually MAKE these? I never understand why people constantly post comments, “I want to make these!” Do it, and THEN post a comment about your experience. That will help those of us that are actually going to make them and not just talk about it. Aimee, I usually used a cupcake plunger when I make filled cupcakes… if i fill them like you said, how will I know if there is enough in the cupcake? And you really just use raspberry preserves? That seems too easy/good to be true! I don’t have a cupcake plunger, so I don’t know exactly how much went into each cupcake. But I did do one, gave it a good squeeze, taste tested :), then gave that same squeeze into all of them! I really just used raspberry preserved…a good quality one though! thanks for stopping by! @Necie this only makes one 8 inch pan if you are wanting a traditional 2 layer cake I highly recommend doubling it! I didn’t because there was only 3 of us to eat the cake. It turned out great however next time I will double it. I did freeze the cake over night made frosting it a dream! Very,very,very good! I haven’t found a recipe for wedding cake online that is this good! Anyone questioning making them, don’t just make them! You won’t be sorry! I can’t thank Aimee enough for sharing it & not hoarding it! Sometimes I do like to hoard recipes (especially ones that I know I sell to customers). But I know I tried for years to make the perfect wedding cake, so I want others to have this at their fingertips!! So glad you enjoyed the recipe Tressa! Oh my gosh! This is the best wedding cake recipe that I have tried! Thanks so much. I’m glad you enjoyed the recipe! Thanks for letting me know!! Here is a link to the cake I made by doubling the recipe. It made two beautiful layers. And I did freeze the cake overnight and it was a breeze to crumb coat. I got rave reviews and had three people ask me to make them one!! Wonderful recipe. Thanks so much Aimee!!! Necie it turned out GORGEOUS!! You have quite the decorating talent!!! I was wondering if anyone has tried to make this recipe gluten free? If so, what kind of flour did you use instead of the cake flour and was there anything you had to add/subtract to/from the recipe? Thanks! I haven’t heard of anyone making it gluten free, but we’ll keep your comment here in case someone sees it!! Good luck! These look amazing. I have to pass this along to my future daughter-in-law. This recipe was amazing. I like the flavor, but next time I make this I think I’m going to make it with regular milk. I think I got the wrong buttermilk. I find that the cupcakes taste of buttermilk instead of almond. The cupcakes are delicious!!! Thanks for the receipe! MMM! My new favorite white cake recipe! I just made these and ate one while it was hot because they smelled so good! I’m making these tomorrow and do not have cake flour, only all purpose. Will it make much of a difference? These came out great! Everyone loved them. My only complaint is that it made a TON of frosting, way more than I needed. I hate to throw away good frosting but I just couldn’t possibly pile any more on these cupcakes! Maybe next time I’ll cut the frosting recipe in half. Also, I wonder if there is a way to make it less sweet. It tastes amazingly good but it’s very very sweet & with so much piled on most people removed a lot of it. A little goes a looooong way. 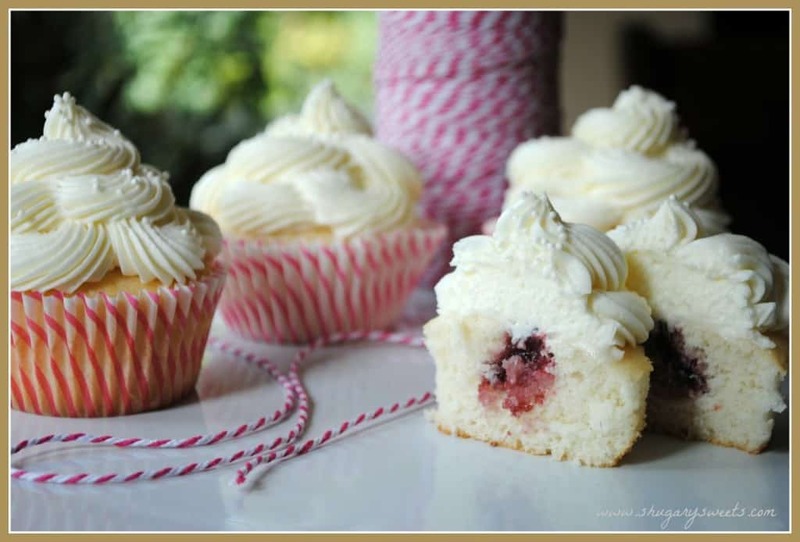 This is a fabulous cupcake recipe. I have made these twice now and they have been a huge hit – once for a friend’s daughter’s graduation party and a second time for a friend’s dinner party. It sounds like a lot of almond extract, but is a perfect amount. Hi LuAnne, YEAH!!! Glad these were a hit for you and your friends!! I am hoping to make these for my soon to be sister in laws bridal shower this Saturday! Does this recipe double ok? So excited to make them!! Yes, definitely good to double! ENJOY. What brand of cake flour did you used? They look amazingly delicious! I use King Arthur, but as long as the box says cake flour, it shouldn’t matter! ENJOY. This recipe looks amazing. 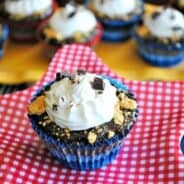 I love making yummy treats like this for my 4 boys (husband included) and also for friends and neighbors. I just have a question for you, could you use vanilla instead of the almond extract? My youngest is severely allergic to almonds. Made these wonderful cupcakes! Everyone loved them! So worth the time and effort. I made these for a friend for her birthday since they were similar to her wedding cake. I’m normally a chocolate person, and I can’t usually stand fruit filled desserts, but these were scrumptious! Everyone loved them, birthday girl included. She said that they were better than her wedding cake. Thanks for the cravable recipe! Allie, so glad to hear you enjoyed the recipe (and your friend did too)!!! thanks for stopping back with this sweet comment! This recipe was awful. The cake came out too spongy and dense. Icing was good though. The first time I made these I used King Arthur cake flour and they turned out great. The next time I made them I used Swans and it came out very spongy. If you don’t over beat, or overcook these cupcakes turn out great. I made this recipe today using two 8-inch round cake pans. I doubled the batter thanks to comments left by others. I wanted to note for anyone else attempting to make this recipe in cake form the bake time for two rounds pans: 30-35 minutes. My cakes took exactly 33 minutes on 350. I can’t wait to try them! They made my house smell amazing from the almond extract. I also subbed 3/4 cup all purpose flour plus 2 tbsp cornstarch in for each cup of cake flour the recipe needed. Cake flour can be quite expensive. Thanks for the recipe! My 14 yr old granddaughter wants me to help her make a small wedding cake for school project. I have made wedding cakes years ago but my question is if I fill between layers with the jam will that be enough and will it leak through the icing. And will the icing hold up since it has whip cream in it at school? Is that why I need to freeze the cake layers? @Terrie I always use this recipe as a cake and I add a small thin layer of icing on the top of the bottom layer and pipe a small amount around the edge as well so the raspberry doesnt leak out. Then I freeze it to set the frosting. When the frosting is firm I add the raspberry then the top cake and frost the whole thing. Hope that gives you an idea of what to do. Works for me all the time. These are beautiful! What piping tip did you use to make the swirls? Hi Amie, I saw your recipe on Pinterest and I am making them for a birthday party for adults 🙂 They look absolutely fabulous! I was wondering if I make the frosting the night before and piped it on if it would hold up? This frosting I haven’t tried to make in advance. If you do, you still may need to beat it again to whip it back to shape! Hi Aimee! I want to make these cupcakes for a shower, but I would need to make them the night before. How stable is the frosting, once you make it? 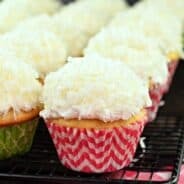 Would I be able to frost cupcakes the night before and leave them at room temperature? Thanks! They definitely should be refrigerated. If you make and frost them the night before and stick them in a fridge, they should be just fine! I tried these and they were wonderful!! I used all purpose flour and they were moist and so tasty!!!! I have to try them with the frosting!!!! I’ve baked professionally for 3 years, and followed directions to a T. They burned to the bottom of the pan (along with the cupcake papers) and had a glue consistency in the middle. Some of these measurements don’t even make sense, you don’t need half a bottle of almond extract. I’m glad you stopped by to let me know too!! This is my favorite vanilla cupcake base….great to make almond, lemon, orange, etc!!! LOVE the idea of strawberry mousse in the center. I made these cupcakes with a different frosting about a month ago and they turned out wonderfully!! Tonight I made them and substituted the almond with vanilla and the buttermilk with milk. They rose in the oven to a point of overflowing and then deflated before they were finished, which resulted in small, sticky (delicious) cupcakes. I thought I may have added too much liquid, so I tried it again, and the exact sme thing happened. Do you have any idea why this may have happened and how I might fix it. Made these today and super easy recipe. I did not eat but my taste tester friend did and he liked it but thought a little more extract could be added and not too moist but it was good. Thanks for the recipe. Does this frosting hold up in the heat? I’m doing a large amount of cupcakes for a bridal shower and delivering them the day before. I don’t want the frosting to melt before the shower. Hi, I made these a few months ago (back in May?) and the frosting did not hold up very well in the heat (maybe only high 70s, probably not even low 80s). They started melting in the kitchen as I was trying to clear out space in the fridge to move them there immediately! Some of them turned out ugly as a result, but they were still really tasty and everyone loved them. I’ll be making these again soon and plan on using a little less liquid and more powdered sugar in the frosting recipe. Hopefully they’ll hold up better in the heat! With the frosting on these being a whipped cream base, I wouldn’t suggest keeping them in the heat at all. You could make a buttercream frosting instead. I have to make 60 cupcakes and send them to a bridal shower 2hrs away. I will not be transporting them so I have no way to icing them there. Would you suggest freezing them to allow them to thaw during the trip/versus risk the icing melting and looking yucky!? Way too much almond extract in the cake batter but other than that delicious!.. Will definitely be making these again with less extract! Many years ago, I worked in a corner bakery. Our bestselling cake was what we called the ABC – Almond Buttermilk Cake. A delicate white cake that we paired with raspberry filling and buttercream icing. It was to die for. I have been looking for the recipe that best fits the one we used in our shop. This seems to be the closest and I am so HAPPY. Can’t wait to bake. Is anyone else having issues with the frosting. Is the cream supposed to be at room temperature? When I beat softened butter with cold cream it just makes it hard again. Then it starts to separate. The cupcake turns out great, but the frosting always gives me a headache. Hmm, sorry this is giving you some issues. Are you beating the butter and cream together before adding the other ingredients? Then beating (again with an electric mixer) for the full time? I make these cupcakes frequently with no issues! I would like to make the cupcakes one day and frost them the next. Is there an issue with the raspberry jam seeping into the cupcake overnight? As well, I would like to use a salted caramel for some instead of the jam, is the cupcake dense enough to hold caramel? The batter sounds amazing. thanks for the recipe, much appreciated. These cupcakes can handle the jam, but a caramel might be too heavy! You can definitely bake them one day and frost the next with no issues, and the jam inside a day ahead would be fine too. ENJOY! Hi…made these amazing babies today for a birthday party, they were great! Very easy to make and the icing is the bomb! My daughter told me after tasting them that she wanted these instead of a traditional wedding cake. They are tasty and elegant…I put them in primary color wrappers and topped them with sprinkles. Adorable!! Hello! Can I just make regular layered cakes with this recipe? Does the buttermilk affect the consistency if I just want to make cakes? Thank you! No, they don’t have to be..
I’m just wondering how you store these cupcakes? Also, will the frosting hold if I frost them the day before and leave them at room temperature on display for a few hours before eating them? Will the filling seep through? Thanks! I plan to make these for my Mom’s bday in a few days. Regarding rhe frosting and using separate swirls/circle, can you explain in more detail how to do this? Is this done all at same time (or do you do circles and let them chill before tiering them? ?And do you do it with the frosting at room temp right after you make the frosting? Sorry I dont have a lot of baking experience, but I have made cupcakes with filling and frosting from scratch before. Thanks so much!! I made these today but my frosting isn’t holding up. It’s melting on each cupcake as I go to the next. My butter was super soft maybe that was the problem. Please help. Best frosting!!! It’s my go-to hands down for the past three years. Rave reviews every time. 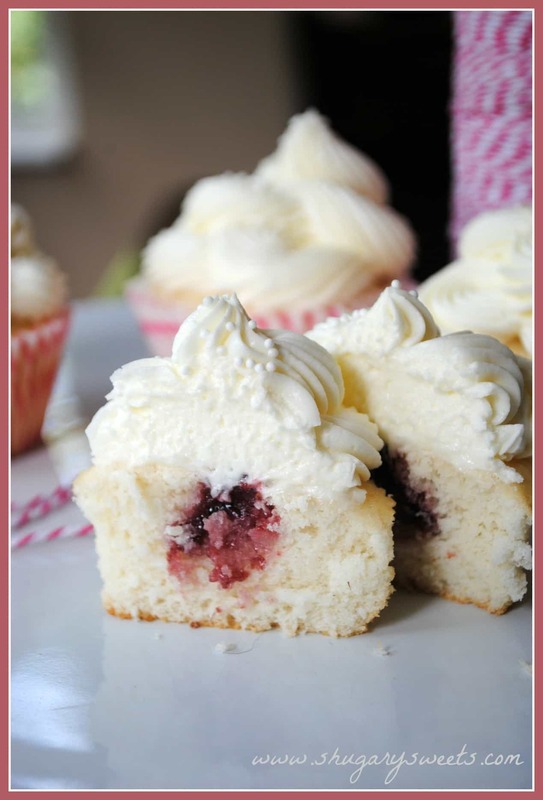 Love the idea of using whipping cream. Rich, fluffy, smooth as silk. Yum.